When the storm is a major event, you need more comprehensive restoration support. SERVPRO of Winter Haven is "Ready for whatever happens." SERVPRO has mobilization teams across the country to travel as needed to support large storm events. SERVPRO as the nation's only Storm Monitor Technology. Provide loss tracking and reporting for storms! As the leader in water damage restoration, SERVPRO knows fast mitigation is the key to limiting business interruption. With an unmatched national footprint of over 1,500 Franchises nationwide, SERVPRO is faster to any size disaster and can be on-site within a few hours to help reduce the future damage water can cause. We have the right equipment, procedures and training to help ensure the structure is dry the first time, saving you time and money. Backed up drainage on a roof caused this Winter Haven patio to flood. This before picture shows the mess left behind after the damage was discovered. SERVPRO of Winter Haven was called in to clean up the aftermath! The homeowner was extremely happy to have our crew come into her home extract the water, re-mediate the mold and remove all the damaged building materials. SERVPRO of Winter Haven is locally owned and operated in Polk County, Florida in addition to bio-hazard clean-up, we provide full restoration services for damages resulting from water, fire and mold. From clean-up to full rebuild services. We are Florida State Licensed Building Contractor CBC-1259536. At SERVPRO of Winter Haven, we make it "Like it never even happened." SERVPRO of Winter Haven is always here to help, and if you feel the video is helpful, please "like it". 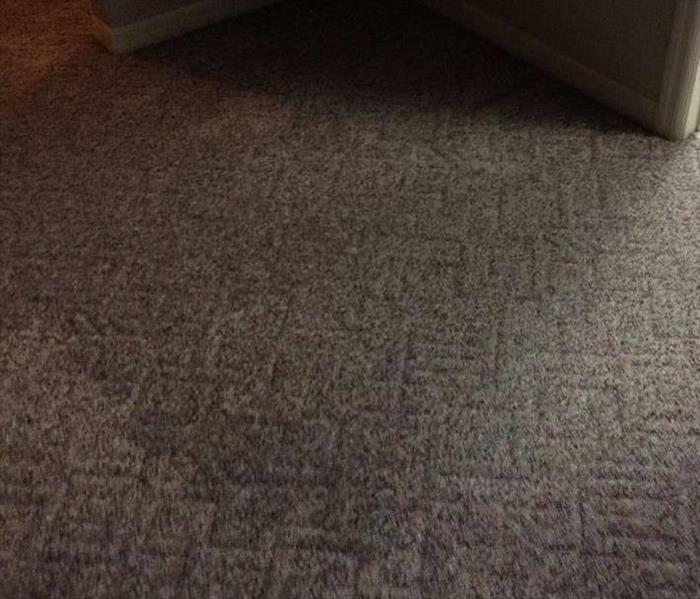 You'll see from the photo the mold that was discovered under the carpet of a Lakeland, FL home. Please notice the discoloration of the flooring. This was caused by a leak in the roof that went undetected for a significant amount of time. The homeowner called SERVPRO of Winter Haven out to take care of the problem. The customer was thrilled to know that all the mold was gone, and his house was back to the way it was before the mold. SERVPRO of Winter Haven makes sure that its "Like it never even happened." Damage a fire can cause to a dining room. Choose SERVPRO of Winter Haven as your fire restoration specialists. Call (863)551-5004 so we can make your experience "Like it never even happened." 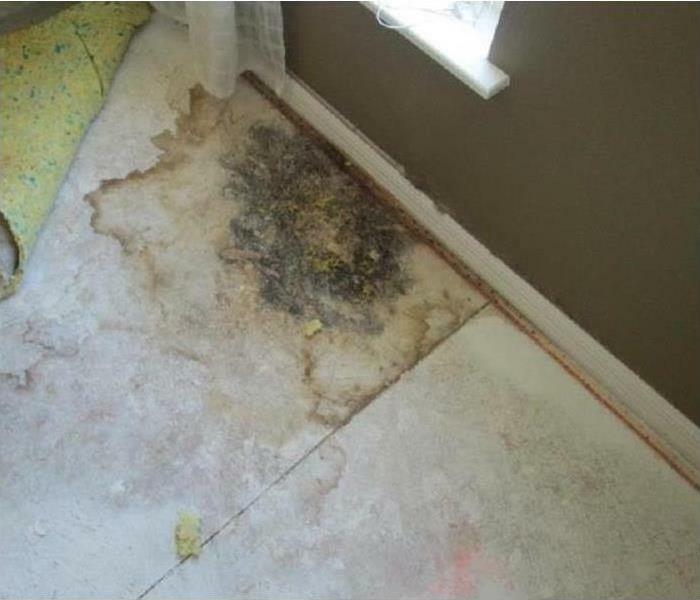 Mold caused by a major water leak. When your Winter Haven business has water damage from flooding or leaks, you need the company that can respond immediately and has the expertise and equipment to properly restore your property. SERVPRO of Winter Haven uses advanced water damage inspection and extraction equipment to help them find the moisture and to remove it as quickly as possible. Our highly trained technicians will monitor and document the drying process so that you know your property is back to normal. The family went away on a well deserved vacation. Do you remember the excitement of coming home on the last day? The thoughts of coming home putting everything away, sitting in the living room as a family just to relax before your work and school lives begin again. Now, they open the door and imagine coming home from vacation and finding your home and garage completely flooded? Unfortunately, this family did. They did the right thing by calling SERVPRO of Winter Haven to handle the clean up of their water to prevent possible mold and mildew damage. We were able to dry the entire home and garage out without having to tear up the flooring or remove any sheet-rock from the home. The in place drying system that SERVPRO of Winter Haven uses saved the home owner a lot of stress as we were able to mitigate the situation quickly without needing reconstruction. Don’t wait – take the following safety steps with your family today. Water for at least 3 days. You’ll need at least 1 gallon of water a day for each person. Don't forget water for your pets, too! Food for at least 3 days. Choose foods that don’t need to be kept cold and that you don't need to cook – like energy bars, peanut butter, crackers, and canned fruit. Don’t forget a can opener! Prescription medicine that you take every day, like heart or diabetes medicine. A battery-powered radio with extra batteries or a hand crank radio. A whistle to call for help. Keep your emergency supplies together in a backpack, bag, or easy-to-carry container. Use a waterproof container if possible. Store your supplies in a place that’s easy to reach. These and many other helpful tips are available at ready.gov. SERVPRO of Winter Haven is a Florida State licensed Certified Building Contractor, Mold Re-mediator, and Mold Assessor. We are IICRC (Institute of Inspection Cleaning and Restoration Certification) certified in Fire/Water/Mold clean-up & restoration. Call us at 863-551-5004, we are always here to help. Hurricane - What to know before they happen! Know your area’s risk of hurricane. Practice going to a safe shelter for high winds. The next best protection is a small, interior, windowless room in a sturdy building on the lowest level that is not subject to flooding. Protect your property. De-clutter drains and gutters. Install check valves in plumbing to prevent backups. Consider hurricane shutters. Review insurance policies. If you have flood insurance, your policy may cover up to $1000 in loss avoidance measures, like sandbags and water pumps, to protect your insured property. You should keep copies of all receipts and a record of the time spent performing the work. They should be submitted to your insurance adjuster when you file a claim to be reimbursed. If sheltering during high winds, go to a storm shelter, or a small, interior, windowless room or hallway on the lowest floor that is not subject to flooding. We here at SERVPRO of Winter Haven would like to thank everyone who attended the 5th annual Community Fest in Winter Haven's lovely new park. 3/22/2019 - Hurricane - What to know before they happen!